John Ruskin, a leading Victorian-era English art critic once said, “Sunshine is delicious, rain is refreshing, wind braces us up, snow is exhilarating; there is really no such thing as bad weather, only different kinds of good weather”. While he might not have had travelers in mind while making this statement, the idea does hold good among many adventure seekers, who are the happiest when out exploring their dream destinations. Talking of dream destinations, Goa definitely makes the cut as India’s favorite. Whether you are a thrill seeker, romantic reveler, party goer, or simply a laid-back soul, the land of the sun, sand, and surf will never fail to entice you. From its serenading golden sands and whimsical waves to glorious churches and magnificent forts, Goa has something for everyone. Enchanted by this temptress of a destination? Well, you are not alone. But many travelers remain oblivious to the fact that the allure of Goa unravels in different forms at different times of the year. So, what is the best time to visit Goa? Read on to know more. Goa basks in the glow of its fun and frolic environment that can be experienced any time of year. On the weather front, Goa has tropical monsoon climate making it warm and humid for the major part of the year. The weather in Goa does not deviate from the common seasonal pattern that marks its way through the rest of India. Like most parts of the country, the region also has distinct seasons – summer, monsoon, and winter. The summer heat beats down on Goa between March and early June. Temperatures usually range between 24 degrees and 36 degrees, sometimes touching even higher. Since the humidity level also remains high, summers in Goa can become a tad uncomfortable. Fab Tips: There are some plus points of visiting Goa during summers. Since it is a lean season, prices take a slash at this time of the year. So, you can expect to get cheaper prices for almost everything, right from your flight tickets and accommodation to food and even car or bike rentals. 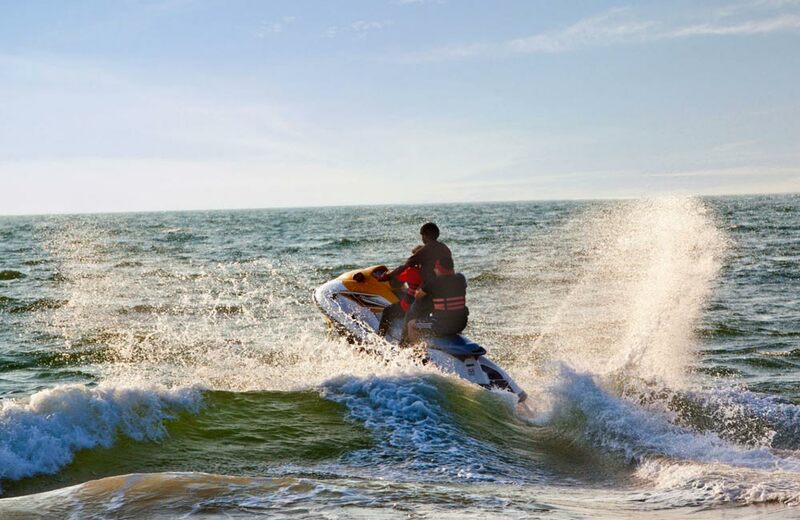 You can also indulge in a variety of water sports at reduced rates, and if you are up to it, you can also visit some of the popular waterparks in Goa to beat the summer heat. Remember, many beach shacks down their shutters during this period due to the low inflow of tourists. Summers might not be the best time to visit the region, but if you don’t intend to get out too much and dare the sun, there’s no harm in planning a trip during this season. Also, it’s a great time for those who wish to avoid the buzzing crowds and get some cheap deals. The rains romance Goa with abundance during the monsoons. Between mid-June and early August, you can find the rains caressing the region almost every day. After that, it may not rain so often, but the sky remains overcast. In September, the post-monsoon bloom lends Goa a lovely look. Fab Tips: The bright side of the story is that during the monsoon, Goa takes on a lush green look. It is the best time to explore the waterfalls as they present a mesmerizing sight, thanks to the heavy downpours that leave them gushing and flowing at their strongest. The sea may throw up huge waves that are not really safe for watersports, but you can always enjoy quiet time on the golden sandy beaches. Since there aren’t many tourists, the prices of almost everything take a dip and tourist hotspots remain deserted. So, that’s another reason to visit Goa during monsoons as you can enjoy the beauty of this rain-lashed region on a tight budget. Adventure seekers can also choose to cruise and raft on the rivers. What’s more, the nightlife here continues uninterrupted during the rainy season. This means even if it’s raining cats and dogs, there’s absolutely nothing to stop you from visiting the bars and pubs in Goa. As monsoon begins to weaken, winter comes knocking with a slight chill in the air. This period can be aptly described as the fair weather season and also the best time to visit Goa. The coastal land enjoys cool breeze blowing in from the sea and the temperature hovers around 20 to 22 degrees. As such, it becomes pleasant to spend long hours frolicking or lazing on the beach. Fab Tips: November to February happens to be the peak tourist season in this Party Capital of India. Thanks to the lovely weather, crowds swell up during this period, there is a festive feel in the air, and nightclubs teem with party animals. It is also the best time to enjoy various watersports and sundown beach parties. If you want to feel Goa’s hip and happening pulse and get your fix of fun, sun, and surf, you must plan your trip during the winter season. But, book your accommodation in advance as most hotels in Goa remain full during this time. What can be a better place than Goa for your honeymoon? Whether it’s your first honeymoon or you are trying to relive the excitement of those initial days with a repeat adventure, this land is perfect for every romantic holiday. Coming to the best time for honeymoon in Goa, it is between October and April. With the weather taking a pleasant turn, the festive vibes start to fill up the Goan air during this time. You can find hotels, nightclubs, and other places decorated with fairy lights, giving the whole atmosphere a romantic feel. Fab Tips: For romantic couples, who wish to avoid the crowd and rush, October, March, and April are ideal for a honeymoon trip to Goa. 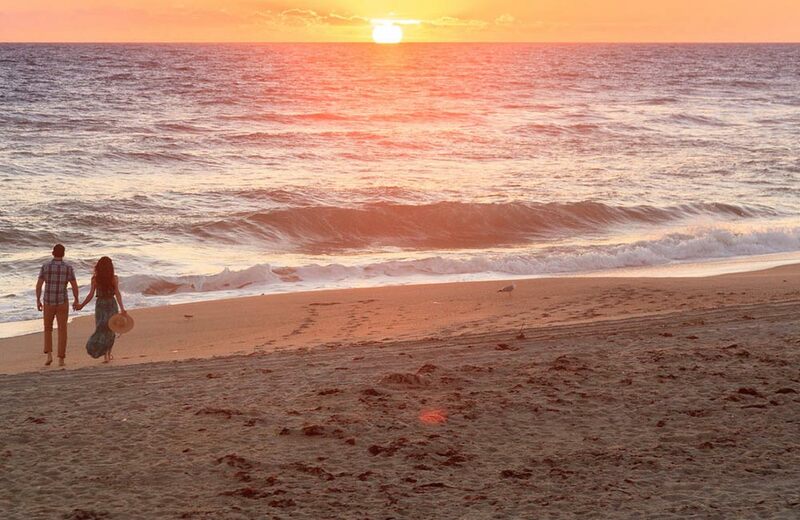 This is the time when you can have the beaches to yourself. The hypnotic beauty of Goa’s romantic beaches can further kindle your blooming love. Engage in exciting watersports, go for long walks hand-in-hand under the moon, enjoy candlelight dinners right on the beach, or simply watch the hues of the sunset from the pristine beaches, all without the pressure of having to deal with a huge crowd wherever you go. You can even book one of the hotels and resorts on the beaches to enjoy a memorable honeymoon. However, if you are enthusiastic about exploring Goa with your partner in all its touristic glory, do plan your trip between November and February. Honeymooning in Goa during the festive season can be an experience in itself. As the whole of Goa wears a festive garb, it can add to the celebratory feel in your heart as well. Sea lovers visiting the place during the peak season, who want the best of the state’s buzz as well as privacy, can head to the less crowded beaches in Goa. Think of Goa and the first things that come to mind are often its sunny beaches, glittering waves, and marvelous churches. But there’s more to Goa than these natural and cultural wonders. It is host to several unique events and festivals that add to its allure. If you wish to explore this aspect of Goa, you need to plan your trip as per the major events that mark Goa’s calendar. The Christmas and New Year parties in this part of the country are spectacular events. From nightclubs to beach shacks, everywhere you will find revelers enjoying to the hilt. Special festivities are also organized at the churches. 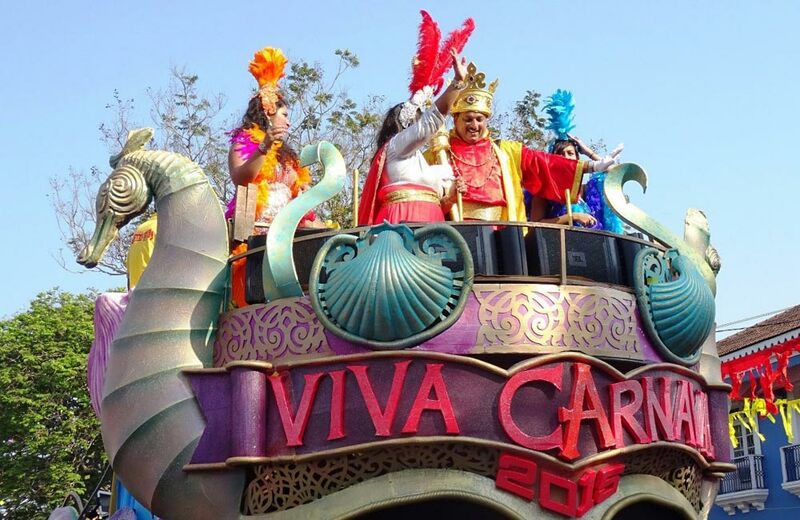 The Goa Carnival is the largest carnival celebrated in India and one of the few that happens in Asia. It is held in late February or early March. The three-day festival is marked by vibrant float parades, dancing troupes, electrifying music, competitions, food and beverages, all of which combine to make it a one-of-a-kind treat for everyone to attend and participate in. The Mando Festival celebrates a centuries-old art form of Goa. This iconic festival has been celebrated in this coastal land for the last 30 years. Melodic songs and enticing dance performances are the highlights of this event that shows a side of Goa that is eclipsed by its glamor and glitz. Goa pays homage to St Francis Xavier, its patron saint, with a grand celebration on 3rd December every year. The day marks the occasion of the saint’s burial. Basilica of Bom Jesus, where the saint lies buried in a silver casket, is the center stage of the festival where millions of enthusiasts from all over the world assemble to celebrate the occasion. Easter celebrations in Goa are widespread, beginning a day before Good Friday. The most amazing celebrations take place in Panaji. Apart from the mass, the re-enactment of the crucifixion of Jesus and the Easter feast are among the highlights of the Easter festivities in Goa. Come November and the crème-de-la-crème of Indian cinema descends to Goa for the glittering International Film Festival. You can even witness international directors and artists attending various exciting events at this festival. As is suggested by the name, the primary event here is the screening of the latest movies made in India across different languages. Every year in January, Goa hosts the biggest wine festival in the country. Held in the latter half of April, the festival offers you a chance to indulge in delicious food even as you enjoy music, dance, and fashion shows. However, the biggest highlight of the festival is the opportunity to taste a large variety of wines made in India. A five-day long festival that celebrates Goa’s rich heritage and culture! You will be able to witness Goan artisans showcasing their skills and creativity. Apart from handicrafts, artworks, pottery, coconut craft, woodcraft, and food stalls, the festival also includes various entertainment performances of traditional folk dances. This festival is celebrated to honor St. John the Baptist on 24th June every year. A unique aspect of the festival is that devotees leap into and swim in wells, ponds and rivers. The festival, which also marks the start of the monsoon season in Goa, is celebrated with much dancing, music, and feni drinking. Celebrated in the month of July, this festival takes place in the Marcel village. It is observed by the Hindus of Goa to celebrate the childish games of Lord Krishna during his early years. Everyone is allowed to take part in this unique celebration, which involves playing in the mud. Depending on how you want to explore the place, pick your best time to visit it. No matter which season you choose to come here, you will return with a treasure chest of memories. So, here’s to a blissful trip.